A Franciscan monk and a friend to both Romeo and Juliet. He preaches moderation because he understands that intensity of any kind of emotion, good or bad, can lead to disaster. Yet he gets caught up in his own hope for ending the feud between Montagues and Capulets. In the process, he shows himself to be quite a schemer. The timeline below shows where the character Friar Laurence appears in Romeo and Juliet. The colored dots and icons indicate which themes are associated with that appearance. Florman, Ben. "Romeo and Juliet Characters: Friar Laurence." LitCharts. LitCharts LLC, 22 Jul 2013. Web. 25 Apr 2019. Florman, Ben. "Romeo and Juliet Characters: Friar Laurence." LitCharts LLC, July 22, 2013. 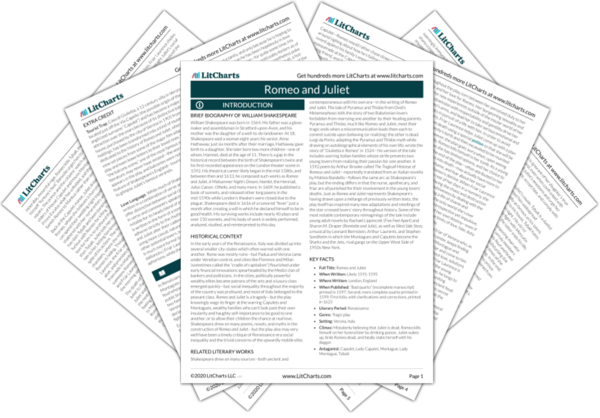 Retrieved April 25, 2019. https://www.litcharts.com/lit/romeo-and-juliet/characters/friar-laurence.